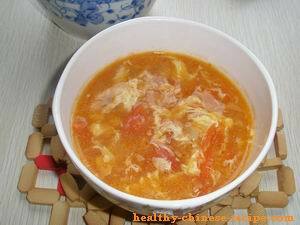 Tomato Egg Soup, or Chinese Tomato Egg Drop Soup helps to remove grease and nourish Yin. It's always served after a meal, especially after a greasy or dry meal. You'll feels refreshing, moisture, and comfortable after serving. So don't add too much oil in this soup. In my memory the best Tomato Egg Drop Soup was made by my mother when I was a little girl. At that time Mom always cooked a big wok of tomato soup. One of my mother's young colleague always joined us. Waiting for the soup cool, I could see the soup shinning in golden light, embellished by bright red color. Pouring on the steamed white rice, the soup flowed down like silk. Take a bite, the soup wrapped rice, smooth, sweet, fragrant, and a little acid which teased your appetite. Frankly to say, the tomatoes and eggs at that time were much better than that of today. When preparing Tomato Egg Soup the key cooking skill is to add wet-cornstarch. In Chinese cuisine it's called Gou Qian,勾芡. If you add too much cornstarch the soup will become thick and not clear. If you add too little cornstarch the soup will like water, not smooth, nor thick. If you don't mix dry cornstarch and water fully and evenly the cornstarch will become a few small flour knots. This really needs your experiences. Another important thing is the order of the ingredients. Add cornstarch (Gou Qian) first, then add egg. Otherwise the cornstarch will wrap the egg. The fragrance of the egg cannot spread in the soup. I introduced two cooking methods for tomato egg soup here. The first one you need to stir fry tomato by cooking oil; the second one is to add tomato to the water or stock. Recipe A. Fully stir fry tomato. Crack eggs in a bowl, fully beat. Add Seasoning, stir fry till fragrance comes out. Add soy sauce, tomato pieces. Stir fry till tomato juice totally comes out. Add a little hot water when dry. But don't add too much water one time, about 1 tablespoon each time. 3. Add 2 cups of hot water. Slowly add wet cornstarch while stir the soup making sure the cornstarch spread evenly in the soup. If not spread in time, the cornstarch will become knot. 5. Slowly slip in egg mixture while stir the soup making sure the egg spread evenly. Otherwise, the egg may become a few blocks. 6. Turn off the heat as soon as possible after the egg mixture totally spreads in the soup. 7. Spread 1 tablespoon sesame oil. Serve after the soup becomes lukewarm. 1. Wash tomato, dice. Mix miso with 1 teaspoon water. 2. Pour 2 cups of water and stock in a wok, add miso and onions. 3. Add tomato pieces, bring to a boil. continue to boil in medium heat till tomato juice totally comes out. 4. Add soy sauce, stir evenly. 5. Slowly add wet cornstarch while stir the soup making sure the cornstarch spread evenly in the soup. If not spread in time, the cornstarch will become knot. 6. Slowly slip in egg mixture while stir the soup making sure the egg spread evenly. Otherwise, the egg may become a few blocks. 7. Turn off the heat as soon as possible after the egg mixture totally spreads in the soup. 8. Spread 1 tablespoon sesame oil. Serve after the soup becomes lukewarm. 1. Don't add too much stock. Otherwise the soup will become greasy. 2. Recipe B uses less oil than that recipe A. 3. Make sure that the tomato juice comes to the soup, otherwise the soup has no tomato flavor. 4. Turn off heat as soon as possible, otherwise the egg flower will be over cooked. 5. When slipping in egg mixture, slip in a little one time. If you slip in whole egg mixture one time, the egg flower will become small and big blocks. If you quickly stir at one direction the egg flower will become very thread; if you wait for seconds and then stir the egg may become thin flakes.